Three NHL outdoor games this season. Three successful events pulled off. We know how profitable the Winter Classic at Michigan Stadium was for the league, and while time will tell how much was generated from the four Stadium Series games and Heritage Classic match-up, it's a safe bet the numbers will be high in the black. As we approach outdoor game No. 4 on Wednesday night with New York's Islanders and Rangers squaring off at Yankee Stadium, eyes are already beginning to look toward next season and where Dan Craig and his staff of wizard ice makers will show off their work. The Winter Classic is already set with the Washington Capitals playing host to an unnamed opponent (Chicago Blackhawks, anyone?) at a location to be determined. There's been no determination yet if there will be a Heritage Classic game next season. The Winnipeg Jets seem to have a game during the 2015-16 ready to go, but for 2014-15, it's anyone's guess. So how many outdoor games per season is enough? If you ask me, I'm good with one or two a year, but according to TSN's Darren Dreger, the NHL seems set at the magical number of four. Every team wants to host an outdoor game and the introduction of the Stadium Series gives cities that may not make the short list to host a Winter Classic an opportunity to do so. Minnesota has been talked for years about as an ideal host, while San Jose and even Phoenix have expressed heavy interest. Then there's Denver, who is getting a push from the sponsor of the Stadium Series: Coors Light. 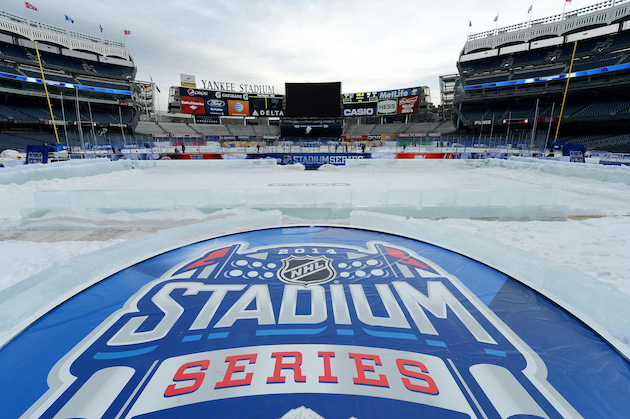 The title sponsor of the NHL's new series of four outdoor hockey games has asked the league to bring the event to its backyard of Denver in 2015 after stops at New York's Yankee Stadium, Dodger Stadium in Los Angeles and Chicago's Soldier Field this year, said Adam Dettman, director of sports & entertainment marketing for MillerCoors. NHL CMO Brian Jennings confirmed the Colorado Avalanche are under consideration to host a Stadium Series game next year. NHL COO John Collins said over the weekend there definitely wouldn't be six outdoor games next season. That helps (somewhat) in alleviating over-saturation and also eases the workload of Craig and his ice staff. But the days of one outdoor game a year seem to be in the past, for now, as profit and growth part of the ambition here.